AnonD-35624, 26 Jan 2012I don't understand y nokia is stopping meego after nokia n9.... y is nokia n9 the first and la... moreclearly, you know nothing about android. AnonD-35624, 26 Jan 2012I don't understand y nokia is stopping meego after nokia n9.... y is nokia n9 the first and la... morebecause they 've lost the patience & r frustrated from losses in each quarter. They are wanting instant recovery instead of investing a lot in New Operating System like meego which demands a lot of initial monetary investments to set up apps. market bases & designing special hardware in order to cope up wid existing giants like Android & iOS.. In a nutshell they r afraid & hopeless of loosing market share & stepping into Meego might be another risk as they thought earlier..
but things r quite different after releasing of Nokia N9 & they have to rethink as sells of Lumias r not up to the mark..
As of now N9 has much larger fanbase than Lumia. N999, 26 Jan 2012How many years are they planing to support this n9 PHONE? 2012 -20?? Will there be after up... moreup to 2015..
Nokia has recently posted a loss of $1.38 billion in 4th quarter.. & that was expected as i feel..
they might be wondering but i've d reason. Let us compare the features of Galaxy SII & Lumia 800.. Lumia 800 stands nowhere compared to screen size, No. of apps available in d market, amount of RAM & strength of CPU & many thing else about which even they are damn sure. Now compare the price..in India Galaxy SII is about $20 cheaper than Lumia 800..
Then why does Nokia want us to buy Lumia 800? Just because of Design & build quality so that people can fall in love as soon as they see & forget everything else.. just as when i fell in love wid Nokia X7 when i went to buy Galaxy S..
& for the God's sake u forget to install a front camera in Lumia 800 & Nokia X7 bcoz u wrongly tnink u r comparable to iPhones in that case people used not to care for a front camera for the sake of iPhone..
Nokia N9 is not available my country still i am planning to import it from abroad instead of buying Lumia 800 suffering from malnutrition..
How many years are they planing to support this n9 PHONE? 2012 -20?? Will there be after update zooming while filming? Thanks so much for answer! I believe that this is the best phone on the market. The multitasking is second to none and its a lot more intuitive and simple than Android. A problem is that the OS doesn't have the functionality (copy/paste) of competitors but that will all be fixed with the next update. This definitely is a phone that will impress as I have one and will make the iPhone look clunky. **DON'T GET TRICKED INTO BUYING A NOKIA LUMIA!!! *** They may look similar but the OS is Windows Phone which has way less functionality (no wireless hotspot or perfect skype/chat integration or Swipe). 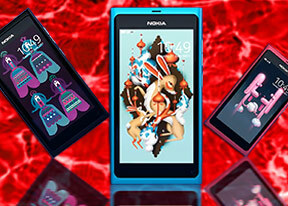 why not Nokia made Meego N9 available to all the South-East Asian countries immediately ? Together....... would save Nokia from the fast sinking boat. Coz, peoples totally rejected the current (fully restricted) window platform OS.... excepting some donkeys. hey boys, I have a question, how many applications are in nokia store for this phone? is any good dictionary? its free ? How can a 1ghz single core meego phone outperform and almost no lag compared to a dual core 1.2ghz+ android phone? I mean cant you people understand how much does the OS of a device means compared to its pointless hardware if the hardware cant make it super smooth. Anonymous, 24 Jan 2012android fanboy lyer!! xD xDits too much fanboyism here, everyone who has problem with their N9 are liars? Im sure you would be very supportive to him if he said the same about a Samsung he owned and wanted to change to Nokia. thryll83, 24 Jan 2012you must be having a fake n9!! !Checking some reviews i found many of my problems adressed, so what i wrote has been confirmed by professional reviewers. Again, note this was before i updated to PR1.1.